Candy that's good for you. 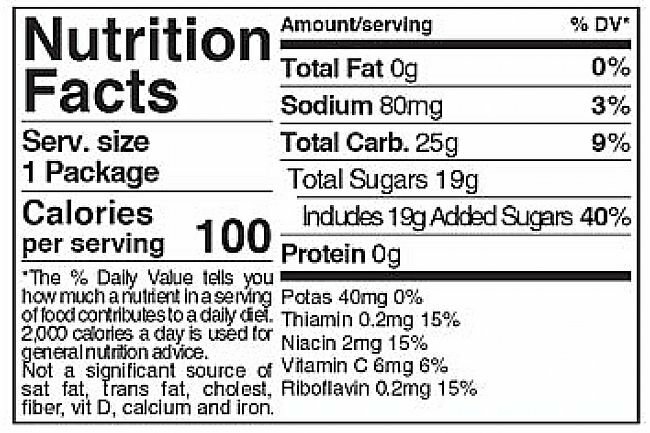 Jelly Belly Sport Beans contain 120 grams of electrolytes, 20 grams of carbohydrates, and 20% daily values of vitamins C and E.
Jelly Belly Sport Beans are sold in boxes of 24 single serving 1 oz. packets. Available in various flavors. The best on-the-go energy, hands down. I've tried a lot of different energy supplements for running and cycling. Sport Beans are far and away my favorite. Gels taste like frosting (yuck for me, YMMV), it's hard to get everything out of the package on the go, and I don't like putting my mouth on the packaging - it irritates the corners of my mouth, and sometimes it's dirty if I'm running on trails. Chews like Shot Bloks or Chomps are too sweet and they stick to my teeth (gross). 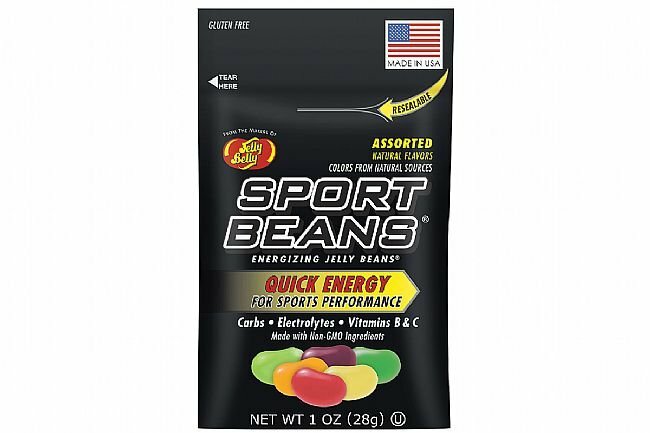 Sport Beans, on the other hand, are a bit more salty to cut the sweet, and the texture goes down easy even on really long runs or rides. They give me the energy I need and have never caused any kind of tummy upset for me. If I keep these around, I'm likely to eat them just as a snack from time to time even when I'm not working out. Yummm. All the flavors are pretty good, so I like the assorted packs for variety. I use these Beans for rides of 2 hrs or longer. They really seem to help keep me going strong. I have never liked eating energy bars it always seemed like a chore but these taste great and go down easy. Well, its sugar, but is the only convenient little snack that doesnt squish or melt in my pocket. I look forward to this little jellybean when I need to go the last 5 or 10 miles. Expensive. But if you're after taste, you can't beat it. Solid energy boost, too. If there was an energy snack to hand out at Halloween, this would be it. You know, to really get those kids pumped. It's a Jelly Belly. That just so happens to have electrolytes in it. love these - tastes like candy and gives you a nice boost. can't ask for more (except more beans, that is. the bags are so small i usually take two). Tastes like candy. Gives you a small boost when you need it. Would buy more if they cost a bit less. 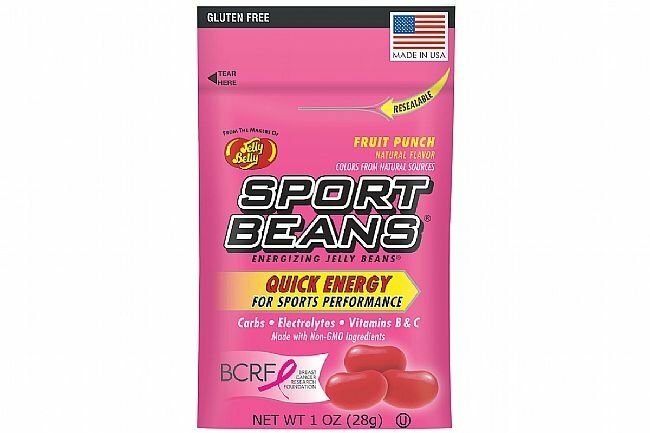 I love these sport beans! 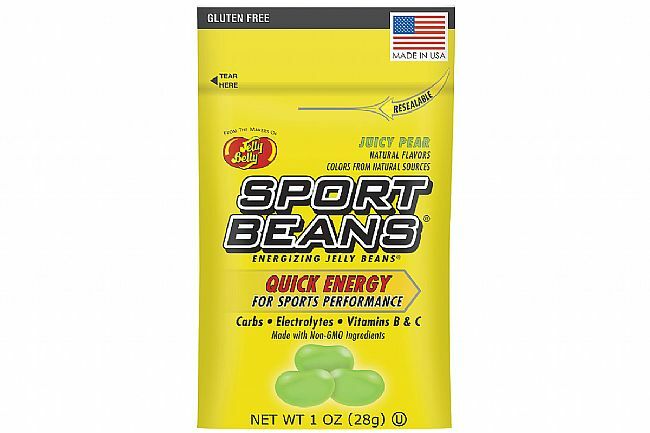 I love the taste of the Sport Beans - and they keep me going during long rides on the bike! Like all refueling products, a bit pricey, but great-tasting and convenient. Easy to eat a few at first stop and finish off later in the ride. Use them regularly, in conjunction with other more substantial refueling products. I like the taste of these jellybeans and the fact that I can eat one or two or the whole package, depending on what I need. If it's been a long hot day, I find that eating them means I don't wake up with a muscle cramp in the middle of the night. Electrolyte replacement at its finest. Good to the last bean! Bought 2 boxes for a fundraising ride to give out. Both boxes were gone in a matter of minutes.